The pageant will consist of off-stage and on-stage portions. Contestants and a parent/guardian MUST attend the contestant and parent meeting along with the pageant dress rehearsal on Tuesday, August 1, 7:00 pm at the fairgrounds. Participation in this meeting by both contestant and parent/guardian is mandatory. Please wear your pageant attire and shoes. On Sunday, August 6, contestants will participate in an interview conducted by the pageant judges. Time will be announced at the pageant rehearsal meeting. ON-STAGE – All activities will take place starting at 3:00 pm on Sunday, August 6, 2017. Contestants will give a brief, 15-30 second, introduction of themselves. Based off each applicant’s registration packet, each contestant will be asked an impromptu question. A pay-out schedule has been developed for the Queen and Runner-Up time commitments and obligations, a total of $600 may be awarded between the Queen and Runner-Up. The Fair Queen will receive a crown and sash at the conclusion of the pageant. 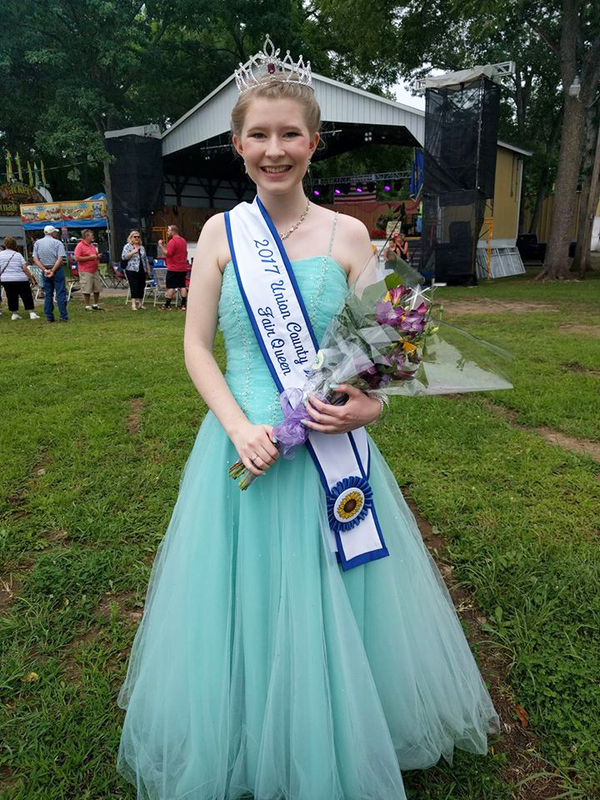 If the Fair Queen meets all obligations as described in the Payout Schedule, she will be compensated $500 at 2018 Union County West End Fair Queen Pageant. If the Fair Queen does not meet her obligations, she will be compensated an amount as deemed appropriate by the Fair Queen Committee and the Fair Association Board of Directors. There is the possibility that the Fair Queen may not receive any compensation. The Runner-Up will receive a sash at the conclusion of the pageant. If the Runner-Up meets all obligations as described in the Payout Schedule, she will be compensated $100 at the 2018 Union County West End Fair Queen Pageant. If the Runner-Up does not meet her obligations, she will be compensated an amount as deemed appropriate by the Fair Queen Committee and the Fair Association Board of Directors. There is the possibility that the Runner-Up may not receive any compensation.